Looking for some ideas for your elementary music classes in the days or weeks leading up to Thanksgiving? 1) Ho Ho Watanay - I used this song with kindergarten and first grade this week. In kindergarten it was perfect timing as we are practicing loud/soft and introducing the term "lullaby". We also tapped on the feathers to the feel of the music (preparing the steady beat). In first grade, we review the beat tapping page, but then take it a step further and look at the rhythm of the song. It is great ta and titi practice. We play the rhythms on hand drums as we sing. You can find slides for the song "Ho Ho Watanay" here. This file teaches loud/soft, lullaby, prepares and practices steady beat, prepares/practices rhythm of the words and ta/titi. I introduce the song "Ho Ho Watanay" with the book "Northwoods Cradle Song". I sing the song on the page turns following every page that reads "Sleep, little warrior, sleep. Go to sleep. Go to sleep." I have looked all over for a song or melody to go with this book from the Menominee tribe, but have not found one yet. Ho Ho Watanay is actually an Iroquois lullaby, but because of the theme of the book and song, I pair them together. I used the book, "One Little, Two Little, Three Little Pilgrims" last week with kindergarten. They enjoyed comparing the lives of the pilgrims and Indians in the book. 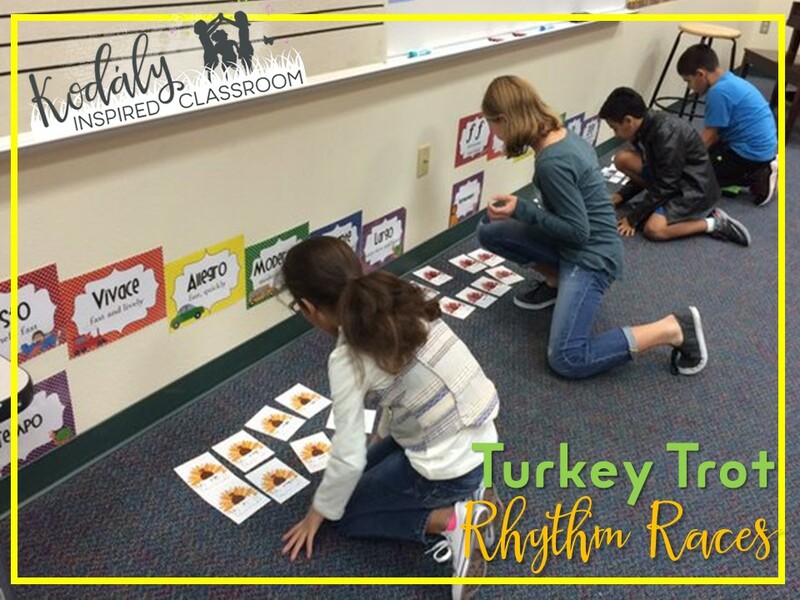 I had to be gone a couple days this month, so I left this "Pumpkin Patch Rhythm Composition" activity for a few classes while I was gone. It was easy for them to do while I was away, gave them more practice writing and working with a specific set of rhythms. I had them do these compositions with a partner and then on a later day, they combined with another pair and taught the other pair their composition and created one long composition out of the two that was 16 beats. The group of four then performed them for the class when I was there, so I was able to use it as a composition and performance assessment and assess two different skills. Working with a partner and then teaching their composition to another pair was really neat to watch. I could tell that because they were writing, manipulating, and teaching it, they really "got it". You can find this Pumpkin Patch Composition lesson here. My kids love rhythm races. They are fun and competitive. I love that it gives me a chance to see which kids really are getting it. I divide the class into teams. My classes have about 25 kids, so I do five teams with 4-5 kids on each team. The teams stand in lines next to their team color turkey. I read/clap/or play a rhythm and one player from each team races to the other end of the room. When they get there, they see piles with turkeys of their team's color. They must locate the correct rhythm and bring it back to their team. The first team to bring back the correct rhythm gets 2 points. If they bring back a correct rhythm, but they are not first, they get 1 point for their team. If they bring back an incorrect rhythm, they get 0 points and they have to go take it back because they will eventually need to find that rhythm. (Photo shared from the classroom of Shelley Potter). I hope you have enjoyed a peek at my week and some of the things I am doing right before Thanksgiving! what do you do with your upper grades? 4th and 5th? I use harder concepts of the Turkey Trot rhythm races with them. They love it. I also have them do the composition project, but with harder rhythms. 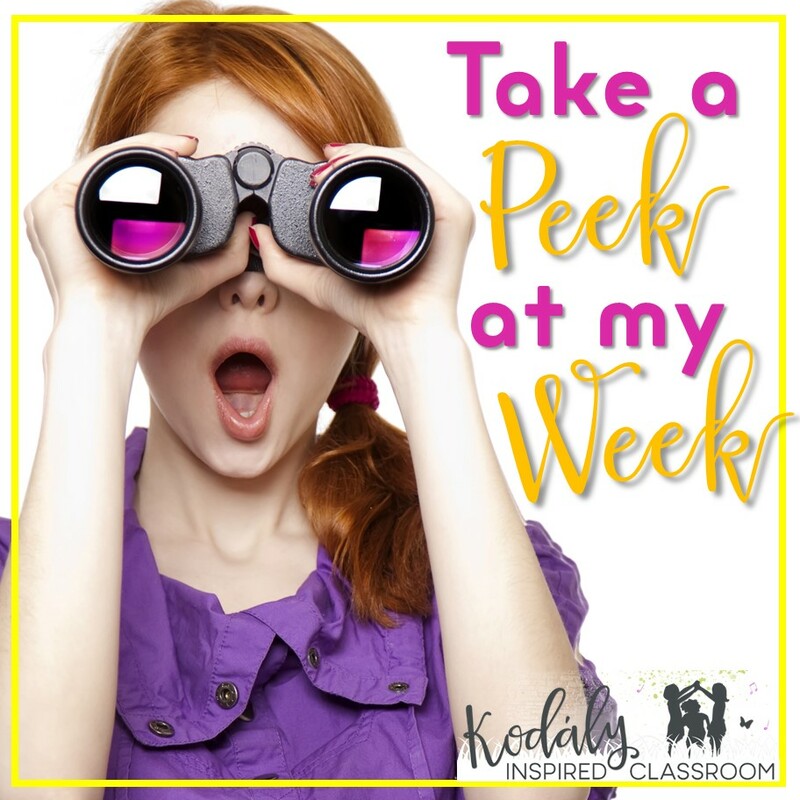 A lot of times I am prepping concerts with those grades, so I spend a little time on program prep, and a little time doing songs and games that reinforce the concepts that we are working on in our Kodaly sequence. So if I am playing Turkey Trot rhythm races, I will just pick the concept that they are practicing. Hope that helps! I'd love to find some more children's literature that would be good for Thanksgiving with the upper grades. Still on the search!